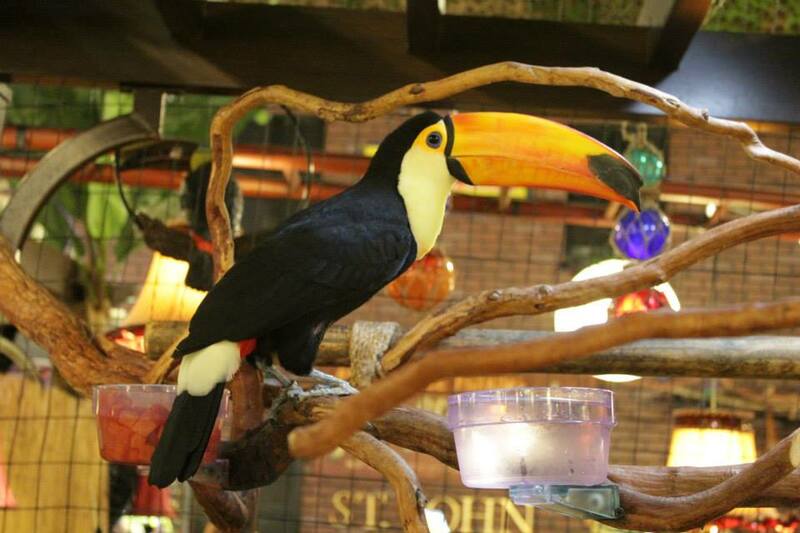 Tiki Toucan curiously stretches his soft white neck side to side, raises his bright orange beak, hops to the highest corner branch, props up his cute red tail, shuts his majestic blue eyes between tuxedo black feathers at his backside and quickly goes to sleep! Tiki loves to be hand-fed ripe papaya, usually in ten small squares twice daily and six tiny slices of fresh banana. Tiki likes to catch tossed grapes by opening his beak and roll a grape back and forth inside his beak for fun. Tiki drinks fresh water from two plastic bowls, eats forty small red seedless grapes and twenty blueberries from a third bowl, and a hearty handful of tiny Mazuri softbill pellets from a fourth bowl each day. Tiki tilts his head sideways, slides his beak upward through a large birdbath bowl of fresh water to clean his beak, then jumps in the middle and flaps his wings to bathe. Tiki playfully hops and flies to comfy branches in his jungly patio and excitedly croaks while watching friend Johnny, the “five-ring swinging” Blue and Gold Macaw perched on an open habitat of three-story tree branches at the front counter fifteen feet away. Tiki happily hops down to greet children and gently clasps food by the tip of his beak. Tiki flies up close to greet Johnny who rides on rings to visit. Tiki’s warm personality influences Johnny to calmly interact. 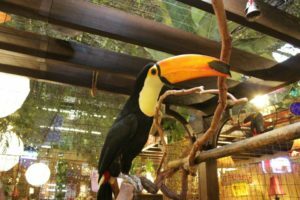 The Toucan mesmerizes the Macaw! 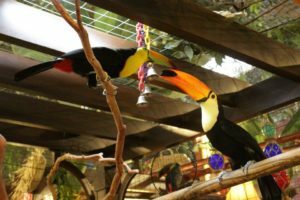 Thanks to Jerry Jennings and Emerald Forest Bird Gardens, our dream of sharing life with a Toucan in sunny Southern California has come true!